Kim at True Up posted last week about showing stashes of fabric. Nettie at A Quilt is Nice also posted her stash. 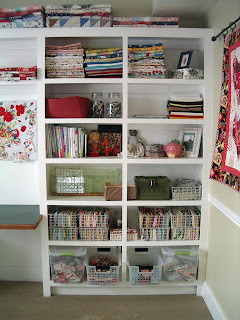 I love to see how everyone stores their fabric and what kind of stash they have. I guess I'm nosey. When I moved into my sewing room after the remodel early this year (above) everything was in perfect order. I love that. But it is hard to use fabric and pull from your stash all the time while keeping it perfect unless you spend lots of time refolding and reorganizing. I do my best to keep it in order but I prefer to sew rather than make sure all the ends of my fabric are exactly lined up. So fast forward to my sewing room today - see below. This is my semi-organized stash. I have tried all kinds of organization methods over the years and this is my latest one. I just fold and shelf. I don't separate color or type. It is too hard to clean up and put away if I put all the same things together. This way it is a blend of color and styles and I've come to be enjoy looking through fabric when I need a certain color because I end up finding things I forgot about! So that is some of my stash. So what does your stash look like? There are some fun things going on around the blogs. Erin is having her first giveaway. Go see her and tell her I sent you. She's a great girl. Jane (another wonderful girl) is having a fat quarter sale for Christmas fabric. What a deal - $1.00 each! Jane and her friend Elaine already sent me their Christmas Cottage Blocks and they are super cute. All those of you that wanted to participate in our exchange but couldn't, go check out Jane's fat quarters. Anyone not in the exchange can send me their cottage pictures too and I'll show them on my blog. 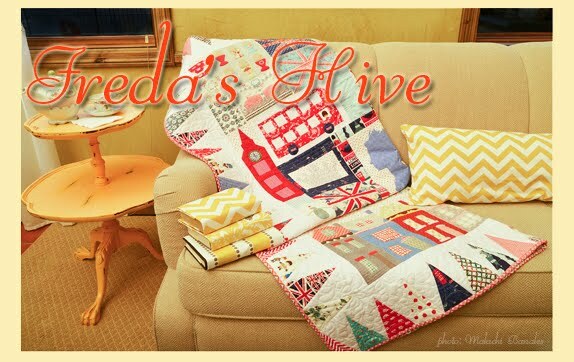 And speaking of cottages go see Patty's blog called My Home Made Life. She has the cutest cottage made with Japanese fabric. You've got to see it. It is so darling. And she has some pretty fabulous vintage quilts on the clothes line too. Good work Patty! And does anyone remember when I told you to go enter Sarah Smith fabulous prize drawing??? That was back in early September. Did you go and enter?? Well I did. And I won 2nd prize!!! Yipee. 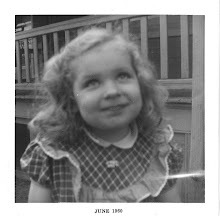 Go to Sarah Smith blog (scroll down a little) and see what I won. I love their products. I won 4 gifts. I cannot wait to get them. I think I recognize some of the names of other winners. Melissa J. and Polly is that you??? I sure hope so. So where are your stash pics? I will post my stash picture as soon as I re-do my sewing room which is way down the list of things to do. I love the way your room looks - very neat and orderly. Well today I wouldn't want to post pics of my stash because I'd have to step over piles to get to it! Ugh! Oh boy are you organized. I'm loving seeing these stashes but I'm suffering stash envy. Well I went to My Homemade Life and LOVE her kokeshi doll cottages. Hmmm...I may have to copy. Fabulous pics! You did a fine job organizing your stash. If it works for you that is what matters most. Thanks for all the links! Patty is my daughter and she is a very talented seemstress.. I'm so proud of her. Little did I know when I taught my daughters to sew that some day they would be would be even better then me. Those pictures make me want to weep they are so beautifully organized. 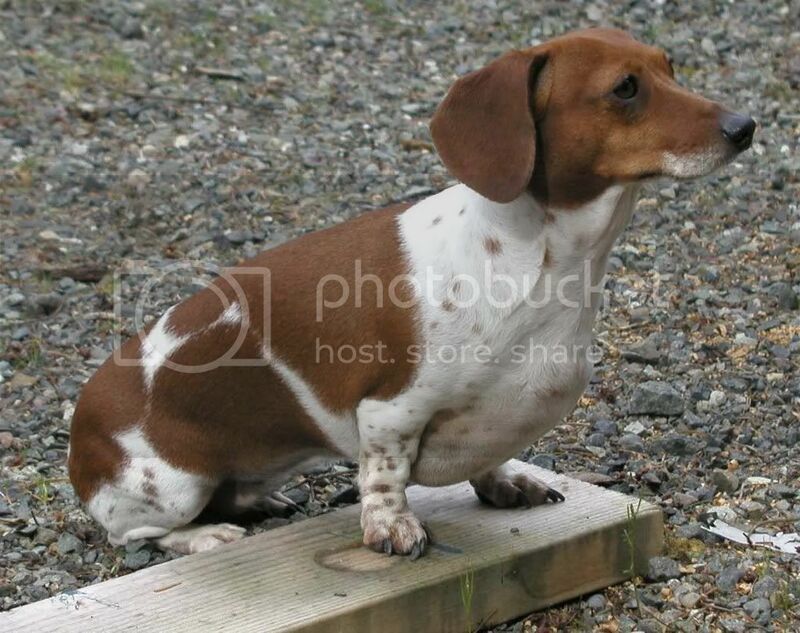 Where did you find such perfect sized crates? My stash would make people weep with frustration so we won't be posting a picture anytime soon! your stash looks amazing and so tidy. Thank you for those links - I just went and bought a load of 30s prints - WHOO!!!! PS-everyone's stash looks so organized! I wish mine looked that good! I'm afraid to show my stash to you... it is a chaos... I love yours, so neat and orderly! what a beautiful sewing room you have! thanks for sharing...i love to see how people organize. I had a lovely time visiting all the other blogs you mentioned today. It was fun seeing other quilter's stashes. Yours looks very neat in in what you referred to as the messy one!Congratulations on the win. Lucky you! Your storage and organizational skills are amazing! Those are some seriously beautiful pictures. My fabrics are mostly in cardboard boxes. That room is to die for.! In my sewing room I go by the motto: Creative clutter is better than tidy idleness. Does that give you an idea of what my stash looks like. 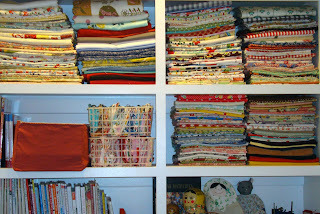 Wow, I love your sewing room and stash! It is so organized! Someday I'll get my sewing room organized enough to take some pictures...maybe after the holidays! Nanette, you're killing me, AGAIN. can you be any more of a winner? neat and tidy stash AND winning all of these goodies around the net. Everyone loves their nanette!! And i say, NO, NO Nanette. (bet you get that one all the time!) Pick me!!! okay, that was dumb, but i'm too lazy to erase. i have transferred all my stash from boxes into Hefty One Zip Big Bags. they are see-thru. i try to put holiday fabrics in one. & i try to group fabrics by color or theme in another. but once i start looking for something it's really messy until i get to put everything back into the bags. so for now i have plastic bags on the floor. under the table. & on top of piles that don't look like they will fall over. but they eventually do fall over. i have taken pics for my own viewing pleasure. but mostly if i do get it under control. i want evidence when someone says it couldn't have been that bad. Very cool stash Nanette! I promise you, you don't want to see mine -- it's about 75% folded and organized, but the other half isn't pretty. And the rest of the room is a wreck with no cleaning in sight -- Christmas is coming you know! Congrats on your Sarah win -- you of all people are definitely deserving!!! I was thinking about snapping a stash photo today. but I have to clean it up first, so it could take me awhile. thanks for showing yours! Wow -- your sewing area is wonderful! I wouldn't dare show a picture of my stash area -- as it's plastic boxes tucked here and there! 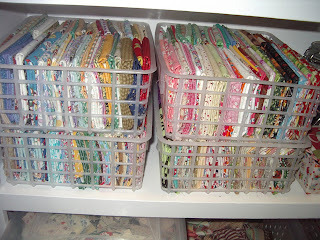 Oh my gosh, I am so envious of the way everyone's fabric is organized. Mine is shoved in a closet, in short it's a mes but out of sight most of the time. I do a little better with my yarn stash which is primarily in a couple of large rolling drawers and some baskets in my work room. I recently "organized" my stash & reduced it somewhat with charity donations & a LQS garage sale. 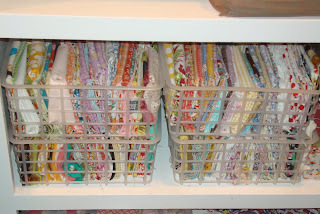 I have my fabrics sorted in Rubbermaid 64 qt totes...28 of them! That's not counting my charm packs, jelly rolls, layer cakes, scraps or "put aside" favorites. OMG, can you say fabric addiction!! I sorted the cottons by color, then sorted flannels, homespun, wide backing, novelty, holidays, etc together. lovely....lovely room.....i have guess-ta-mated it would take about 8 pictures to capture all the glory and splendor of my stash (( yeah right )) my glory and splendor is just about to take over the WHOLE upstairs!!! What a wreck i have made lately!! A while ago you made two baby quilts for your friend Jan where you sewed squares on top of a piece of fabric. Do you remember the name of that pattern or who the designer was? Mmmm ... must say I'm in the same boat as Em ... must tell you, I am MINIMALIZING ... maybe a lot of the girls out there would appreciate some of my stash! Crossed my mind today - shall think about it further after seeing everything so NEAT!Hugs - Lurline! Your stash picture is just too lovely! Your room is fabulous. Mine looks nothing like that, although I am trying to get it straightened up. i spent some time organizing the other day...you're right, you can spend a bunch of time doing that. i loved seeing your stash...kinda like heaven might look! Oh I love how organized and pretty your stash looks! There are lots of pictures of my stash in various old posts on my blog. If you'd like to see what it looks like - particularly after I redid my sewing room just over a year ago - look for "organization" in my label list on the blog sidebar. 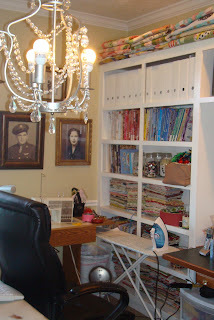 I love the look of your sewing room! The built-in shelving is lovely, and it's all so neat and tidy. Maybe I should quit spending so much time organizing my fabrics, and put them on the shelf just the way you do. I always like finding an old piece of fabric that is "new" to me once again! Wonderful links, by the way! I love seeing your stash...it looks so neat. I've tried to organize mine by color but it just doesn't seem to work. I love the little plastic crates you used. Where did you find them? So clever and so easy to see each fabric. I might have to copy some of your ideas. Will try to post my stash sometime soon.